Hello! I’m really excited to share these photos – finally something outdoors that makes me look like an actual blogger! These were shot by the lovely Rachel around Manchester, I’m so pleased with how they turned out. These fabulous trousers are clearly the star of the show – I took a trip to Primark after posting about my top 10 picks of boho printed trousers and found these! I love the fit, the colour, and the print – they’re pretty much ideal and are a bargain at £12. I also bought this Topshop top recently, with exactly these kind of printed pants and maxi skirts in mind. I bought the petite version so that it would be cropped just above the waistline of the trousers – it’s super versatile and the lace texture is really pretty too. I have embraced the ‘boho revival’ in full and finished off the look with a Primark necklace and fringed suede bag from BANK. I’m also wearing the blogger approved chunky white Frances sandals from My First Wish. Let me know what you think! Love how you've styled them, the top is sooo cute! LOVE THE BOHO STYLE ON YOU! This trousers are awesome and they look lovely on you! Can't believe that they were only £12 as well! 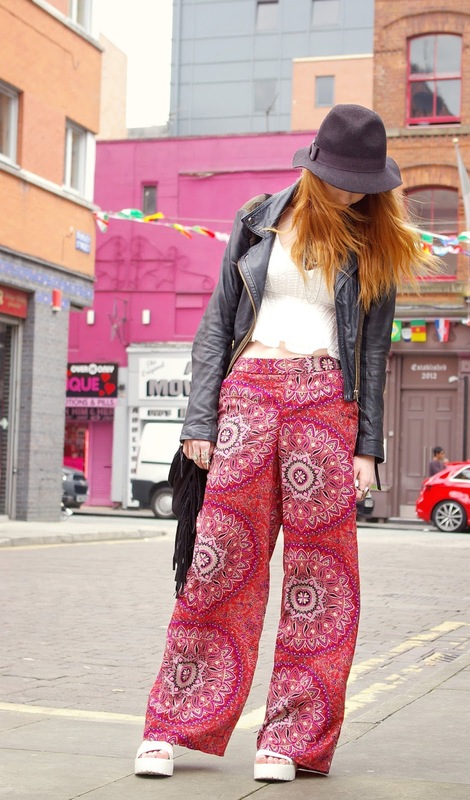 Gorgeous printed pants, I need a pair like that! Awesome trousers. Ones like these are my favourites for the summer!